2K and Firaxis have got the great idea to share the 10 minutes of gameplay for XCOM 2 that were presented at E3, and commented here by creative director Jake Solomon. Watch the HQ streaming inside or download the 3.6Gb file for maximum quality. The title will release in November for PC. Thanks for the high quality downloads, Gamersyde. I've only seen video from this game on youtube before, and it was (as usual) heavily compressed, making the surfaces look all flat and polished. It's nice to see there's actually some detailed textures in there. This is one of my most wanted games this year. Is it just me, or does this look a lot more cartoonish and plastic than the first one? It sort of looks like simcity for some reason, maybe it's the lighting. I wonder what made them go this route. Given that the setting is supposed to be an ultra high tech utopia created by alien intervention, I think that it makes a lot of sense that it looks that way. I suspect over environments will look less so. All in all I think it looks really damn sharp and like a hell of a lot of fun. This looks great but I could never get into turn based games. Logically, they bug the heck out of me; it makes no sense for characters to stand there waiting and then all the sudden in cut scenes things become real time like at the end when the monster moved in, covering a lot of would be tiles to stop their evac. And why would a sword wielding character be designed to move in and attack only to be stuck there surrounded by the remaining enemies? The logic there just bugs me, it feels too designed. I know, what You mean, but it was always like that. :-) You love it, or hate it. I still would prefer to try Wastelands 2 instead, than this. 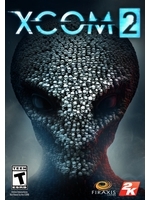 And I loved XCOM: Enemy Unknown and XCOM II. The dynamic music, if that is dynamic music, is awesome. However the enemies having a free attack upon appearing seems indescribably cheap, especially with that drop-ship since there is no way I can see to predict where it would drop them in order to prepare. Don't worry, they said during an interview that it was scripted for the demo and that they won't get a free move once they drop down from their vtol in the actual game. Hope that there´ll be a console version, the controls worked really well for XCOM on a gamepad. Probably the sale numbers on consoles weren´t satisfying? Otherwise that version would have been planned from the start.